This cool space wallpaper shows an artist’s impression of the free-floating planet CFBDSIR J214947.2-040308.9. This is the closest such object to the Solar System. This cool space wallpaper shows an artist’s impression of the free-floating planet CFBDSIR J214947.2-040308.9. This is the closest such object to the Solar System. It does not orbit a star and hence does not shine by reflected light; the faint glow it emits can only be detected in infrared light. Here we see an artist’s impression of an infrared view of the object with an image of the central parts of the Milky Way from the VISTA infrared survey telescope in the background. 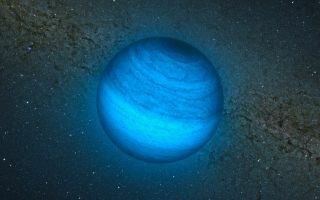 The object appears blueish in this near-infrared view because much of the light at longer infrared wavelengths is absorbed by methane and other molecules in the planet's atmosphere. In visible light the object is so cool that it would only shine dimly with a deep red color when seen close-up. This image was released Nov. 14, 2012.